On Friday, September 23, 2016, at approx 2:00pm, Absegami High School officials received information that a student was carrying a handgun on the Absegami school campus. At the time the information was received, the accused student was in gym class, which was outside in the area of the track/football field bleachers. 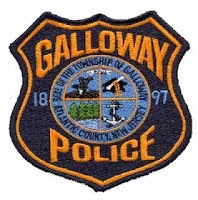 Galloway Township Police, along with school personnel, responded out to the field where they saw the accused student. At this time school “lock-down” announcements were made over the school’s loud speakers. After the announcement, the accused student observed officers approaching and reportedly put his hand into his left front pants pocket, grasping something, and ran out of view of the officers. Once officers made contact with him at the edge of the bleachers, he was detained. He did not have a weapon in his possession nor anything in his pockets at that time. Additional officers from Absecon Police, Mullica Township Police, and members of Atlantic County SWAT responded to assist. As the firearm was unaccounted for, and fearing the weapon had been passed on to another student, all students in the area were ordered to lay on the ground. They were then patted down for weapons and removed from the area. Once all the students were relocated, the area was searched. Under the bleachers, in the area the accused student ran to, a .380 Jimenez Arms automatic pistol was located. It held 5 rounds with one loaded in the chamber. At this time the “lock-down” was lifted and students were escorted to their buses or otherwise released without any injuries. Other area schools delayed dismissal and remained in a “shelter in place” mode until the Absegami grounds were cleared. The “lock-down” lasted approximately 40 minutes and dismissal was delayed by about 20 minutes. After further investigation, the accused student, a 15 year old male from Galloway, was arrested and charged with Possession of a Weapon, Unlawful Possession of a Weapon, Possession of a Weapon on School Property and Possession of a Defaced Firearm. The student was lodged in Atlantic County Juvenile Detention Center. Special thanks to Absegami school staff and students for their swift action and full cooperation with our investigation. If anyone has additional information they are encouraged to contact Detective Sergeant Ryan Goehringer at (609) 652-3705 ext. 331. Tips can also be submitted anonymously through Atlantic County Crime Stoppers at (609) 652-1234 or 1-800-658-8477. What a great job by law enforcement in a very difficult situation. Please let it be known that Sergeant Joseph Picardi did an AMAZING job with Incident Command on an incredibly chaotic scene. Between the chances of what "could have" been actually happening and being responsible for the actions of more than 20 other officers, it was a truly impressive showing of command and the true definition of grace under pressure. This township, and especially the parents of the children attending Gami might not know it, but his actions today were incredible and did not escape this writer. Kudos Joe... You deserve it! Seriously why don't you go get yourself a law degree. Perhaps his fingerprints are enough to dis claim hearsay... Luckily no one was hurt because a 15 year old thinks it is cool to carry a loaded weapon into school. Perhaps he will finish his education in a cage so the rest of the kids can get theirs safely. Great response by the officers involved. This could have taken a very bad turn, they did an amazing job. Hearsay.....why defend the young thug. He got caught and locked up and that's all that matters.